Tagum Philippines may have been known since 2006 as the Palm Tree Capital of the Philippines, with almost 5,000 various palm tree species planted all over the city, but it would be most appropriate to call it the City of Festivals. After all, there are at least 15 festivals in the city as of last count. Barely 13 years after its creation as a component city in 1998, Tagum is fast catching up with the other cities in the Davao Region, and is in fact at the top of the game when it comes to the success of its festivities, arts and culture. “We have a series of Festivals the whole year round so tourists have lots of choices when they visit Tagum,” Tourism Council chairperson Alma Uy said. A study by the Asian Institute of Management has included the city on the list of 20 cities that are most viable as a business destination. Tagum City’s abundant supply of raw materials has been maximized to good use and it should not come as a surprise considering that Mayor Rey T. Uy is not only a successful businessman but also an agriculturist by profession. A tour around Tagum would show visitors how Uy managed the city like a business. The Tagum Engineering Service Center, more popularly known as the “Motorpool” had almost everything the city needs to be self-sufficient in its operations including a garage and repair shop for vehicles and construction materials and equipment. The facility is equipped with almost all equipment you will find in every private contractor’s site including road rollers, backhoes, graders, bulldozers and dump tracks. Apparently, the city has its construction division not only to construct the city’s infrastructure needs, but it also does business with the other local governments providing additional income to the local government of Tagum. The growth of Tagum Philippines in such a short time was so remarkable it was evident that the officials were intent on implementing the reforms introduced by Uy. While most local government units find it hard to collect real property taxes efficiently, Tagum was recognized by the Department of Finance for its 101% efficiency in its real property tax collection effort. The city’s soon-to-be-completed City Hall is guaranteed to make every visitor gape in awe. Once completed, it will become the only government institution in the country that will be housed in a futuristic structure similar to the Australian Parliament Building. While there are people who criticize its grandiose structure, the more progressive ones feel that it is evident of the mayor’s big plans for the city. It cannot be denied that Tagum is a success story worth emulating and this was confirmed by no less than the officials of 49 cities and municipalities who went to the city for a Lakbay Aral tour. Even Commissioner Ricardo de Ungria of the National Commission for Culture and the Arts admitted how Tagum Philippines has grown by leaps and bound when it comes to culture and the arts. The annual Musikahan Festival, which showcases the Filipino youth’s musical talents, has placed Tagum in the world map. While Musikahan started out as a national level competition, it made history this year when it was held along with the 3rd International Rondalla Festival which attracted musicians from Asia, America and Europe. Davao City may have failed to cash in on Durian despite the abundance of the fruits in the city but Tagum Philippines came forward and came out with yet another attention-catching festival—the month-long Durian Festival which is celebrated usually from July to August. The Festival has made Tagum the Durian capital not only of Mindanao but of the Philippines. But aside from the usual avalanche of durian fruits that you see along the highways and the durian park, the festival goes deeper. Thus, when you go to Tagum for the Durian Festival, you can expect a full entertainment package including Durian eat-all-you-can affairs, durian culinary experience, durian pastry and beverage making lectures and farm tours. Prepare to feast not only on fresh durian during the Festival, but also on processed durian and value added products like durian coffee and durian cake. To make the durian industry sustainable, the local government of Tagum invested in the “plant now, pay later” program in 1998 which now has 210 farmer-beneficiaries and involves 2,100 hectares of land planted to durian. Under the program, the government provides seedling, fertilizers and other inputs to the durian farmers while contributed their labour and land. Mayor Uy was encouraged to start the program after a visit to Chantaburi in Thailand where he saw the potential of a high-value crop such as durian as an income-generating product for Tagum City. Thailand’s durian farmers are weekend farmers who held full-time jobs and tilled their durian farms part-time. Durian farmers in Thailand only have small portions of land but they practice community farming. Despite the abundant harvest of durian in Tagum, Alma Uy said the city is still not ready for the export market because “supply is just not enough”. She said they still have to learn a lot when it comes to durian management and propagating the perfect variety of durian for the export market. Tagum’s durian farmers got significant input from Thailand, Cambodian and Vietnamese experts during the Durian Forum funded by the Australian Agricultural Department last September as part of the celebration of the Festival. Experts from Thailand are willing to help Tagum Philippines in terms of durian management so they could penetrate the export market. “There is actually no competition since Thailand has a different durian season compared to us so we will not compete with the market,” she said. Straight from the Durian Festival, tourists need not leave Tagum Philippines anymore because the NCCA-funded Indigenous People’s Festival follows on October 7. 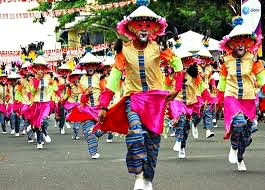 Dubbed as “Dayao”, the P7-million Festival will be attended by up to 440 participants from various cultural tribes all over the country. Uy said they would not have accepted the invitation to host the 3-day Festival because of the lack of time. However, trust the city to come up with something whenever there is a challenge to do so. With barely a month to prepare, the 25-hectare Energy Park in Barangay Apokon has been transformed into a multi-cultural park with exact replicas of the houses of the Subanen tribe representing Mindanao, Ati tribe representing Visayas, Tugan tribe representing Tagum and several other tribal houses. Visitors to the Dayao Festival can expect seven exhibition halls that will feature textiles and ornaments; mats, basketry and bamboo crafts; musical instruments; Moro armaments, culinary exhibit, traditional games and traditional kitchens of the different tribes from all over the country and its neighbors in the Brunei, Indonesia and Malaysia regions. Tagum City boasts of other festivals including the Binuhat Festival in July which is an opportunity for the gay community to showcase their skills and talents. Then there’s the Summer Sports Festival in May. Incidentally, Tagum will host an international football festival next year.